Vancouver Canucks forward Loui Eriksson exited Sunday night's game against the Anaheim Ducks in the first period after a knee-on-knee collision with Chris Wagner. Eriksson received help getting off the ice and went straight to the dressing room and ruled out for the remainder of the game with a lower-body injury soon after. The Canucks won the game 2-1. Canucks head coach Willie Desjardins said after the game he had no update on the winger after the game, but expected him to be out "a couple of games." 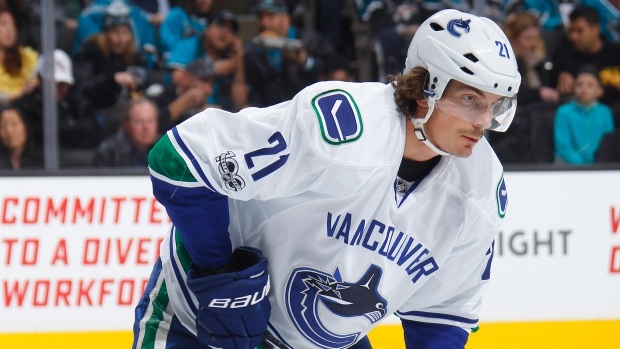 No update on Eriksson from Desjardins, but he expects the forward to be out "a couple games." The 31-year-old owns 11 goals and 24 points in 64 games with the Canucks this season. He snapped a nine-game pointless streak with two assists against the LA Kings on Saturday night. Eriksson signed with the Canucks in July as a free agent after three seasons with the Boston Bruins.